Please Note: Our KM1 Modellbau images may only show a representative model of a class/series. Please check the product description for actual color, era, details and other options for each stock number. Please contact us before ordering if you have any questions. 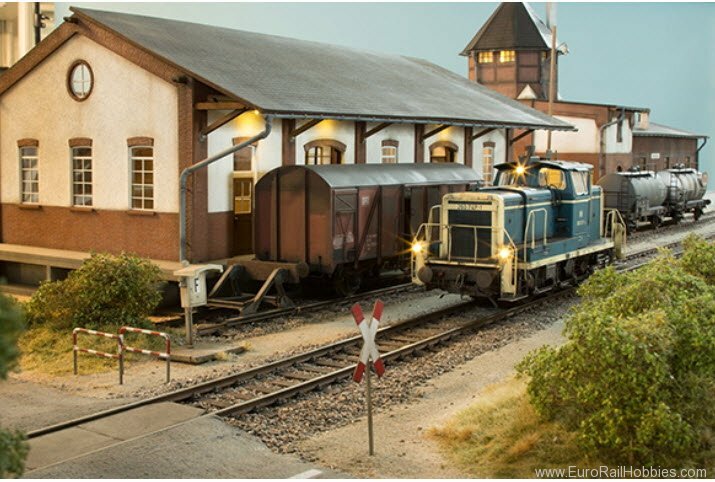 The goods shed Gerstetten with its two gates on the loading side complements the building ensemble Gerstetten. Its mixed construction with bricks and plaster harmonizes with both the reception building and the engine shed. The gates can be opened, the layout of the interiors and the complete framework of the roof truss are reproduced. The building is based in the basic construction on the goods shed Danube valley. This is in contrast to Gerstetten completely emulated in brick construction. In the original, the goods shed Donautal has three loading doors on the road and on the tracks. The basic kit, however, only has two goals for a length of 720 mm. With the supplementary set, this goods shed can be extended by one gate as often as desired. The model is available as a ready-made model and as a kit and consists of laser-engraved HDF panels, plywood veneer and phenolic resin, gutters made of plastic 3D printed and other metal parts made of brass or zinc casting. L 720 x W 510 x H 263 mm. Size of the supplementary set: L 270 x W 510 x H 300 mm.